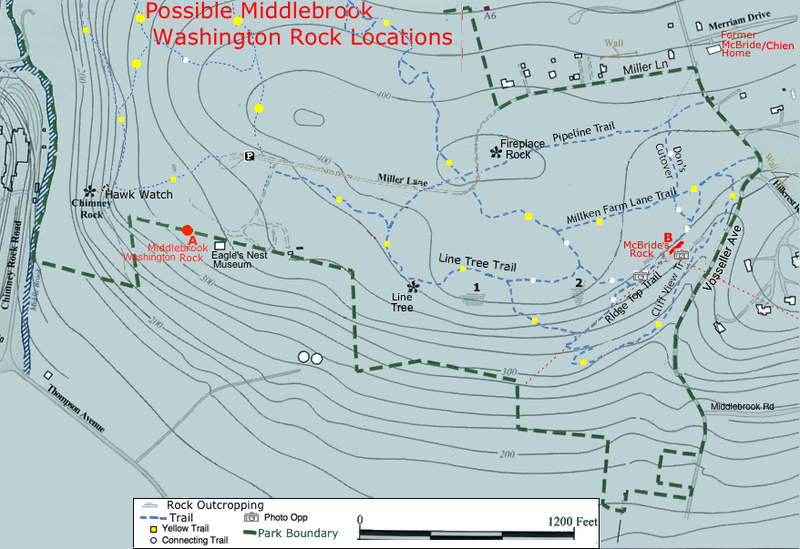 McBride's Rock is a newly identified Washington outlook at Middlebrook Heights (The first range of the Watchung Mountains between Vosseller Ave and Chimney Rock Rd. in Martinsvill NJ), uncovered by Historian, Robert A. Mayers' and described in his new book, Revolutionary New Jersey: Forgotten Towns and Crossroads of the American Revolution. where he named this rock "McBride's Rock", because I had guided him thru the woods to show him the view from the 25 foot cliff, I had enjoyed for 40 years, 1/4 mile from the McBride/Chien house. George Washington used it to watched British General Howe in New Brunswick in 1777 when his army was camped on the ridge above it right where we lived. The traditional Washington Rock is at Washington Rock State Park in Green Brook (5 miles from the Middlebrook Encampment). Washington used it when the British moved east towards Amboy (Perth Amboy), Staten Island or New York. He also used it during skirmishes in Quibbletown (now New Market section of Piscataway), Plainfield, Scotch Plains, Woodbridge and Edison, including the battle of Short Hills, which actually occurred at what is now the Plainfield Country Club. Mayers has more about that in his book. But, when the British were stationary in New Brunswick Washington used the Middlebrook location, where his army was camped. It is a basalt (blue stone) rock cliff near the top of the first range of the Watchung s near Vosseller Ave in Martinsville (Middlebrook Heights). It is 240 ft above the valley below. It's about 110 ft. wide and the top is 25 feet above the ground at the bottom. 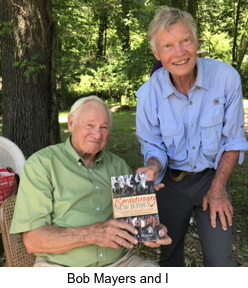 At the Washington Campground Association Meeting in February 2017, Historian, Robert A. Mayers from Watchung gave a talk about the new book he was writing, Revolutionary New Jersey: Forgotten Towns and Crossroads of the American Revolution, he described a historical record he found of a Middlebrook Heights outlook where George Washington watched British General Howe in New Brunswick. 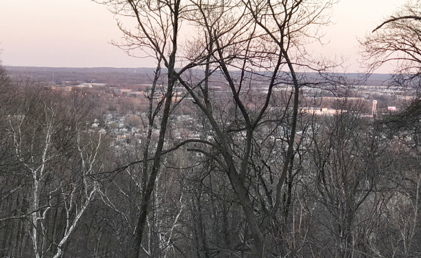 Middlebrook Heights is the Watchung Mountains between Vosseller Avenue and Chimney Rock Road. He also found a sketch of the rock there. 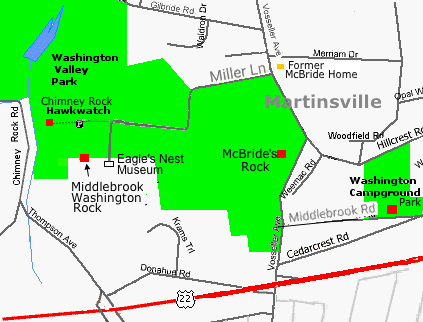 There was another candidate for Middlebrook Washington Rock between Herb Patullo's Eagle's Nest Museum at the end of Miller Lane and Chimney Rock. Because of easier access and proximity to the museum, Mayers had named it Middlebrook Washington Rock. I thought the sketch looked like a rock I had walked by for 30 years. 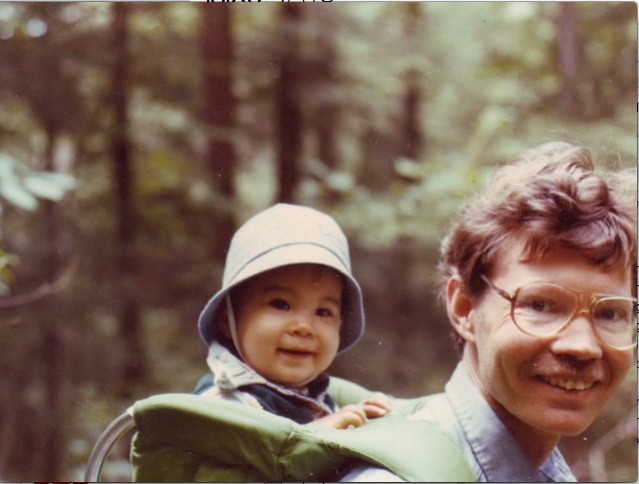 In 1979 I used to take my 1 year old son, Tom, riding in a child backpack, on hikes across Vosseller ave through the woods in the undeveloped Washington Valley Park . 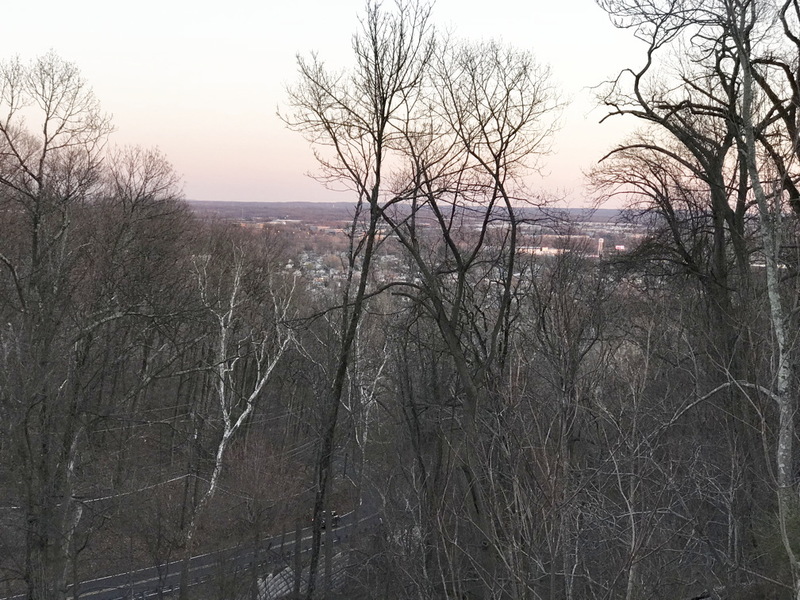 We used to go to the top of a rock cliff at the edge of the first range of the Watchung Mountions a quarter mile from our house and look at the view. I always thought it would be a good place for Washington's troops to keep a eye on the British. I continued to hike in that area and lead hikes there for the Raritan Valley Group of the Sierra Club. I hadn't been by it in years so went over to take a look at it. 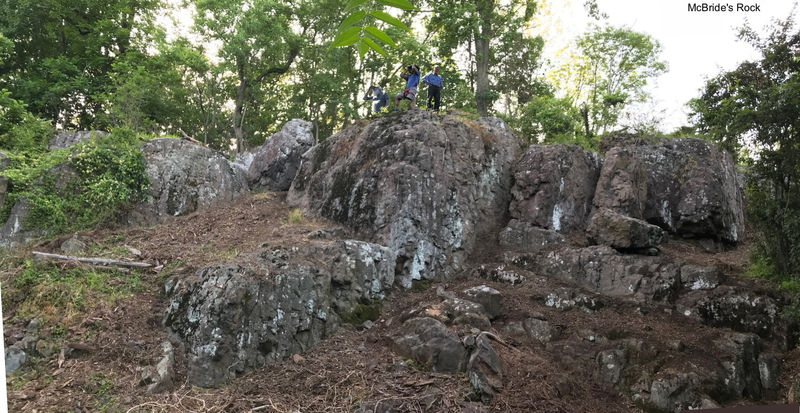 It was now a jungle; The rock face was covered with vines, there were downed trees from hurricane Sandy leaning against it and thickets of stickery invasive Japanese barberry at the top and bottom. A friend, Dave McRitchie, and I pulled down the vines, rolled the dead trees down the hill and cut back the barberry. I showed Mayers the location nearer Vosseller Ave, which which only the mountain bikers knew about because of the proximity to one of their trails. It was a 2/3 mile hike thru tick infected woods from the Chimney Rock parking lot, so most hikers didn't go buy it. The 1/4 mile hike from the corner of Vosseller Ave. and Miller Lane was not on the park service maps. Mayers admitted there were reasons McBrides Rock was the more likely candidate. It was the best match for the 160 year old sketch of the lookout at Middlebrook Heights in his forthcoming book. 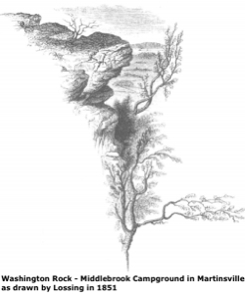 The large boulder in the middle right of the picture above could be the rock outcropping at the top of the sketch which had broken off over the years. The traditional Washington Rock is at Washington Rock State Park in Green Brook (5 miles from the Middlebrook Encampment). 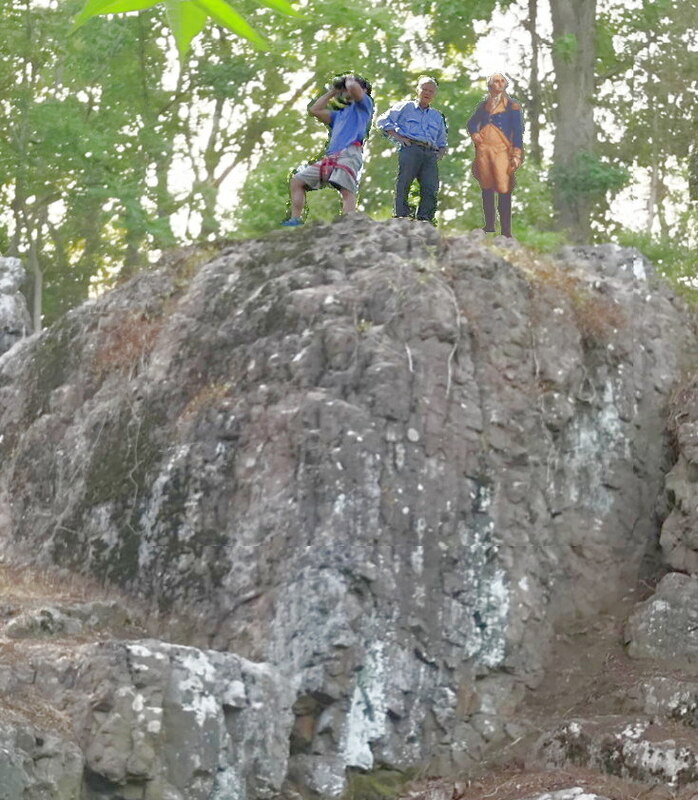 The Green Brook rock has a view east all the way to New York and is where George Washington went to monitor British Troop movements, when General Howe was moving toward Westfield and Staten Island. 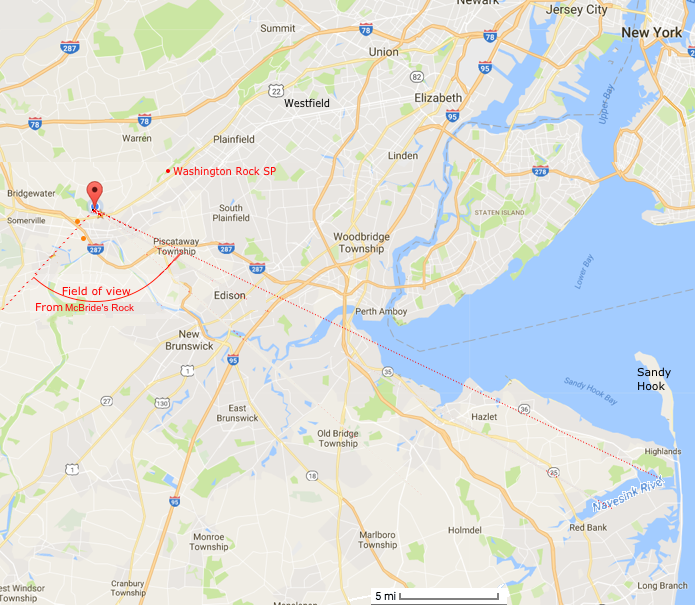 However when Howe was stationary in New Brunswick it makes sense that Washington would have watched them from Middlebrook Heights where his army was camped in 1777. General Wayne's Brigade was camped, according to Captain Scull's map, right at the current intersection of Vosseller Ave. and Millers Lane. Mayers thought he had found Middlebrook Washington Rock, between Herb Patullo's Eagle's Nest Museum at the end of Miller Lane and Chimney Rock. In the meantime Herb Patullo had expanded his Eagle's Nest Museum near his house at the end of Miller Ln. 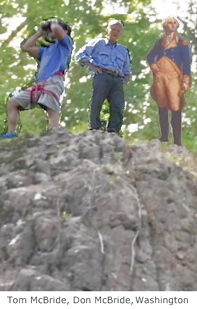 with an expansive view of the valley below including New Brunswick to include the area around the rock there. There was parking and easy access there, so that location became the official Middlebrook Washington Rock. In Chapter 6 "Washington Rocks: Perches of the American Eagle (1777-1778)" of his book Revolutionary New Jersey: Forgotten Towns and Crossroads of the American Revolution Mayers has labeled the rock near Vosseller Ave. McBride's Rock. Zoom out to Washington Valley Park. There is no parking near McBride's Rock. In the summer you can see it from Vosseller Ave. but there is no place to pull over or stop. You could park at the Chimney Rock parking area and then follow the trails for about 2/3 mile to get there. There is a place to pull off Miller Lane where it bends to the right and follow the trail 1/3 mile to the top of the rock. From the top of the rock it about 1/4 mile using the trail towards Vosseller Ave. to the trail at the bottom. 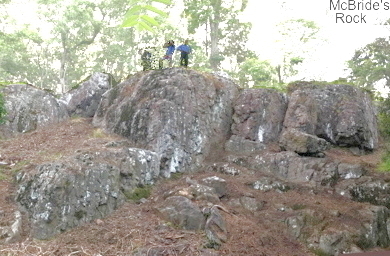 Rock formations look like Lossing's drawing. It is a higher elevation (375') vs the chimney rock location (315'). That is where General Wayne's Brigade was camped. I did quite a bit of excavating to improve access and kept a lookout for artifacts. The only thing I found was borken piece of a square cobalt blue glass bottle. See archaeology.